The AllegroGraph Docker container is now available on Docker Hub. Linux users can use the same container, but do not need Docker Toolbox. NOTE: if you already have VirtualBox installed, follow these instructions to completely uninstall VirtualBox, then come back here to install Docker Toolbox. Download the Docker Toolbox installer and execute it. NOTE: we use the "Docker Quickstart Terminal" below for demonstration. # Only execute this command once!! This shows you have no running docker containers. $ /Applications/VirtualBox.app/Contents/MacOS/VBoxManage controlvm default natpf1 "tcp-port10035,tcp,,10035,,10035"
$ "\Program Files\Oracle\VirtualBox\VBoxManage.exe" controlvm default natpf1 "tcp-port10035,tcp,,10035,,10035"
You will get an error about the rule existing if you execute the above command twice. to get a specific version. The v6.2.2 part is called a tag and you can browse the available tags to find a specific version of AllegroGraph. -d runs the container in background and print container ID. -m 1g assigns 1 GB of memory to the container. -p argument and values are to make those ports available to applications (i.e., browsers and Gruff). --shm-size 1g set the shared memory limit to 1 GiB. AllegroGraph requires 422MiB of shared memory segment for each running repository. --name agraph assigns the name "agraph" to the contain, to be used in place of the container id (which is a very long hex number). franzinc/agraph:v6.2.2 specifies which image to run. You would need to use the docker run form again only after executing docker rm agraph to remove the container created by docker run. After the above docker run command, to use AG WebView browse to http://localhost:10035. The default user name and password is test and xyzzy. If you started the container with the docker run command above, then your data is being stored in the same container in which you are running AllegroGraph, in the volume /data. Read on to make a separate container for your data, so that it will be persistent independently of the container running AllegroGraph. The --volumes-from says to mount volumes from the specified container, which in this case provides an empty /data. Now stopping and deleting the agraph container will not perturb your data, which is in the agraph-data container. What if I need to execute ancillary AllegroGraph commands? $ docker exec agraph su agraph -c "/app/agraph/bin/agload test /data/actors.ntriples"
Load finished 1 source in 00:00:04 (4.01 seconds). Triples added:       166,497, Average Rate:   41520.00 tps. The container id in this case is agraph. You should see the VirtualBox Manager window. Now, click on the "Settings" then "System" buttons to see the system settings, where you can change the amount of memory available to the boot2docker-vm virtual machine, which in turn effects the amount of memory available to Docker containers. Unlike with the AllegroGraph VM, which has Gruff installed inside the VM, when using AllegroGraph and Docker you run Gruff on your host computer. See the Gruff download for more information on downloading and installing Gruff. If you have an older version of VirtualBox installed, Docker Toolbox will likely not work well, so we recommend, if you have VirtualBox installed, that you completely uninstall it before installing Docker Toolbox, since it contains an installation of Virtualbox. 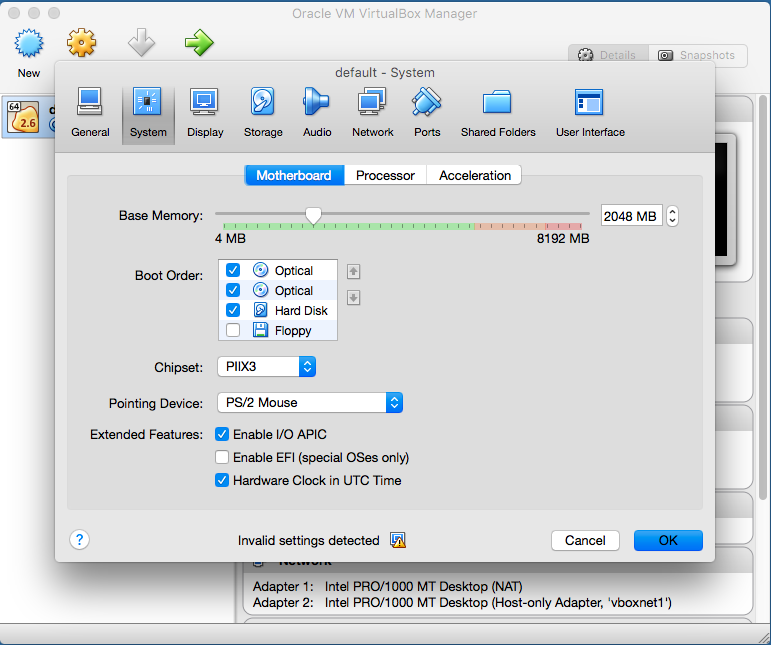 Note: following the uninstall instructions will leave untouched your VirtualBox virtual machines. 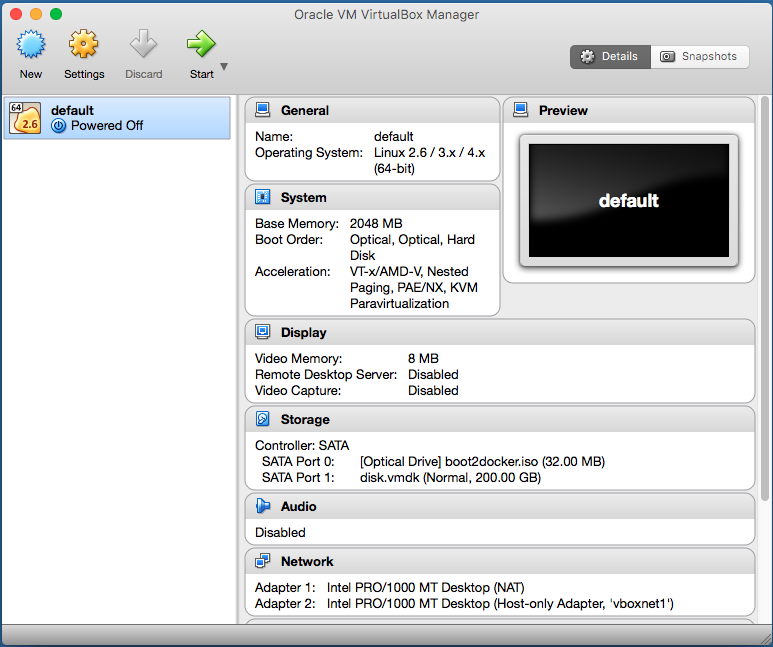 Find the "Uninstallation" section for your operating system in the VirtualBox documentation. If you have a previous version of Docker installed, you might consider moving ~/.docker [Mac OS X] or C:\USERS\USERNAME\.docker [Windows] aside, so it isn't used, unless you have existing Docker containers you are using.